Note April, 2004: A few more copies have become available in January, 2004. There are a number of addenda and other improvements. I managed to keep the price very near to what it was in 2001, 68 Euro. But as the Euro has gone up, this unfortunately would now be around 85 USD. Note July, 2001: Announced years ago, the new edition finally went to press. The book has been thoroughly revised, reconfigured and updated and now includes all--real and imaginary--butterflies and moths mentioned in all of Vladimir Nabokov's published writings, prose and poetry, letters, interviews, book reviews and technical papers. 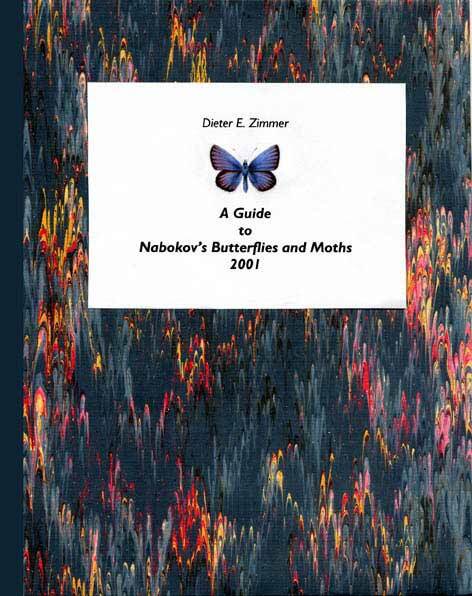 In the catalog sections, the Lepidoptera are fully identified, referenced, cross-referenced and annotated, making it possible to trace any one butterfly through Nabokov's writings. There are the common names in six languages, including Russian. There is a special section on the Lepidoptera named by and for Nabokov and another one with capsule biographies of entomologists related to Nabokov's work. There are 21 pages of color figures. There also is an eighty page introduction discussing Nabokov's entomological work and its relation to his fiction, the basics of taxonomy, the species concept and Nabokovs special interest in mimicry. Compared to the preliminary editions of 1996 and 1998, the word count has gone up by 75 per cent. *This is not a commercial publication. There are no author's royalties and no publisher's share. Nobody is going to make a penny from this book. It is privately published by the author and made available in a limited number of copies. The amount quoted covers at most 75 % of the cost of printing, binding and shipping. Sorry no discount of any kind can be given. The book can be ordered from the author or through booksellers. A German bookseller specialized in serving university libraries abroad is Otto Harrassowitz in Wiesbaden. If ordering from the author, payment within Europe by bank transfer to giro account free of charges to the recipient; payment from the U.S. and Canada by personal cheque drawn on an American bank. Normal mode of shipment is Economy Mail (which is not surface mail as one might suppose but air mail too; however, it may take longer than Global Premium Mail). For Global Premium shipment overseas (that is the fastest kind of air mail), a surcharge of 20 US $ will apply (rate valid as of July 1, 2001). Orders by e-mail or mail to the author and publisher.